It is beyond me as to how the US public could put this man in the White House. The war of words between North Korea leader and Trump. This reminds me of a couple of bratty 10 year olds arguing over, who has the bigest arsenal. This is not the way that the President of the US should act. Mark O will be along shortly to put you right on this. I don't understand what problem you have with Trump over this? The fruitcake in N.Korea started it and is making all the threats why would you not expect a response from a (ie any) a leader of a nation in the firing line? Trump is brilliant. I wish he was our PM. And calling those who advocate common sense before left wing PC insanity "fruitcakes" is an old and outdated, ploy of the old and outdated left. My understanding is that they proposed firing missles towards Guam, not actually at it, and it's the sort of statement that the N Korean leadership have been making for years. No-one else felt the need to escalate, or it they did then it was through appropriate diplomatic channels, not twitter. Essentially, the people of Guam are caught in the middle of a spate between two leaders, neither of whom they had any say in electing. Giving his low rating in the polls, Mr Trump may will be looking for the sort of boost that generally comes with a bit of armed conflict with a much less powerful and politically isolated country. I vaguely remember we dealt with this in the old forum, I may be misremembering. Anyway, there were two busts of Churchill in the White House, one on loan to George Bush and returned at the end of his presidency (actually I believe the loan was extended into the Obama era), and one that belongs to the White House and was there, is there' and probably will stay there for the foreseeable future. Whatever Obama keeps in the cupboard, it isn't Winston's bust. I vaguely remember we dealt with this in the old forum, I may be misremembring. You're not. Mark was put right on this a while back, but he still trots out the old 'bust in the cupboard' nonsense. Storm in a teacup, all thanks to sloppy reporting, as explained in the last paragraph. This from Peter Hartcher, political editor and international editor The Sydney Morning Herald. Is Kim Jong-un mad? You could be forgiven for thinking so thanks to media reports about his general setting out publicly a detailed plan for the bombing of a US island, Guam, home to a huge American military base. But many news outlets have been a bit sloppy in their reporting of the North Korean threat. Two key facts were omitted in most of the news reporting. First, the North Koreans are at no point threatened to bomb the island of Guam, which has a civilian population of some 150,000 as well as 12,000 military personnel and their families, on the Pentagon's figures. Specifically, the commander of the North Korean Army's Strategic Force, General Kim Rak-gyom, said the force was "carefully examining the operational plan for making an enveloping fire at the areas around Guam with the medium-to-long-range strategic ballistic rocket Hwasong-12," based on the English-language version supplied by the official Korean Central News Agency. Even more specifically, four missiles would fly over Japan at 3,356.7 kilometres for 1,065 seconds and land in waters 30 kilometres to 40 kilometres off the coast of Guam, Kim's statement said. Its purpose would be to "contain" the US strategic forces on Guam. Kim said he would present the plan to the supreme command by mid-August.This is a different proposition to a threat to bomb the island. Of course, it presupposes a degree of accuracy that may be more hope than reality. Second, North Korea is always careful to avoid threatening a first strike on the US or any country. As the director of the Korean Studies Institute at the University of Southern California, David Kang, told The Washington Post: "The big thing we keep missing about North Korea is that their threats are always the second half of a sentence, and we ignore the first half. North Korea consistently says, 'If the US attacks us first, we will fight back'. The only thing that gets reported in the US media is the second clause, not the first. So their comments are clearly deterrent in nature, and the Guam 'threat' was exactly along those lines. So we always overhype the North Korean threat." What's true of the US media is equally true of the Australian. We did indeed, and this is the link that will.15 directed Mark O to in March last year, whereupon Mark O acknowledged that he was mistaken. The article is dated July 27 2012, and is written by Dan Pfeiffer, former Senior Advisor to U.S. President Barack Obama for Strategy and Communications. So Mark, may we please consider this settled once and for all? The bust of Winston Churchill has a prominent place in the White House -- in the Residence, outside the Treaty Room. To get serious for a moment. 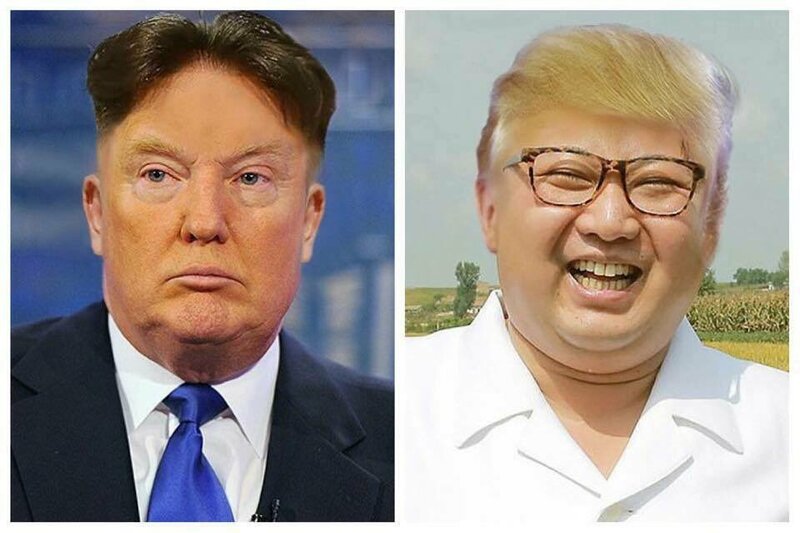 Who has the worst haircut, Trump or Kim Jung-in? That's a tough one, John! Wouldn't it be funny if BoJo was Britain's PM and Geert Wilders was Holland's? The Ferocious 4! Kim, definitely, looks like a burnt sausage roll on his head lol. Uncle Donnie is lucky that he has not suffered baldness, I have no doubt many lades fancy him, for his golden aura, in every way. Ah, that's better. He almost looks human!